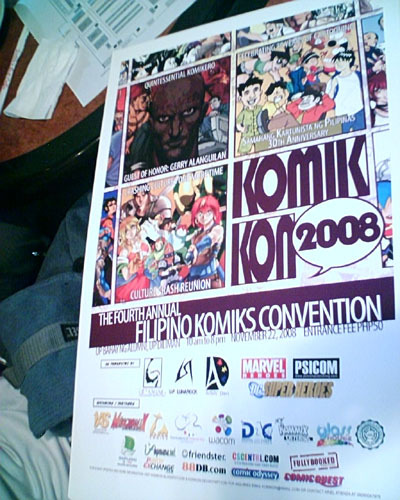 Here’s our official Komikon 2008 poster and buttons. 2) SKP 30th Anniversary: Meet your favorite comic artists and get a limited edition SKP roster book. 3) Culture Crash Reunion: Need I say more? Meet the wonderful people behind this hugely popular magazine. But wait, there’s more! We’ve got a lot of activities scheduled on the week prior to November 22. Check out our KOMIKON 2008 Week-long Schedule. On Nov 22, join contests, have your caricatures made, request your favorite artists to sign your comic books, buy the latest Filipino comics or get updated with the latest in our Komiks Indie Tiangge! Early attendees will get loot bags. Winners to the Character Creation, Comic Creation and Make The Page challenges will also be announced. All of these for only Php 50 entrance fee. Invite your friends and have a fun-filled day. See you there! Komikon 2008 is organized by the Artists’Den in cooperation with UP LUNAROCK, UP GRAIL and PSICOM with our partner sponsors: IAS, Mangaholix, Mango Comics, FirstAcademy.net, Wacom, DAC, Kommix Veterans, GHG, CSB, WikiFilipinas, Comic Odyssey, CSCentrl.com, Comic Quest, FullyBooked, PinoyExchange.com, Friendster, 88db.com.